Throughout the year, we host many events at our cemeteries to remember and celebrate life. This calendar provides information on our events which all are welcome to attend. It also provides information on other events within our Catholic Community. We hope to see you at one of our upcoming events. Memorial Mass Chapel of Christ our Light Mausoleum A Memorial Mass honoring the deceased is celebrated on the 3rd Saturday of each month at 8:30 in the morning. All are welcome to attend. To RSVP for an upcoming event or to join our email distribution list to receive updates on cemetery events and promotions, please email us at events@holysepulchre.org or call us at (585)458-4110. 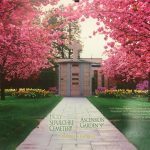 FREE 2019 Calendar: Our 2019 calendar containing beautiful images of our cemeteries and information on our events throughout the year is now available in our offices while supplies last. If you would like a copy mailed to you, please email your name and address to events@holysepulchre.org or call us at (585)458-4110. Monday–Friday 9:00 a.m. to 4:30 p.m.